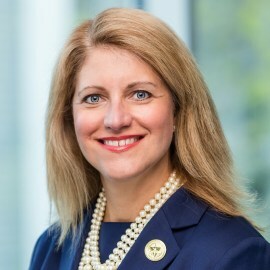 Laura Bishop serves as the Vice President of Advancement at Oral Roberts University and is responsible for the university’s Development and Alumni Relations, Marketing, E21, Public Relations, and GEB teams. She previously served as the Vice President of Development and Alumni Relations, and prior to that, as the Executive Director of the National Christian Foundation of South Florida. She has also served as the Co-Executive Director of Lifework Leadership of South Florida; Development and Communications Director for both Habitat for Humanity of Broward and Westminster Academy; Television Director of ITV in South Florida; a radio talk show host; and owner and president of Bishop Public Relations, which served Fortune 500 companies.